International Schools are expensive in Hong Kong and it is difficult to make a choice and decide whether it will a good choice depending on different factors, but most predominantly cost (money). 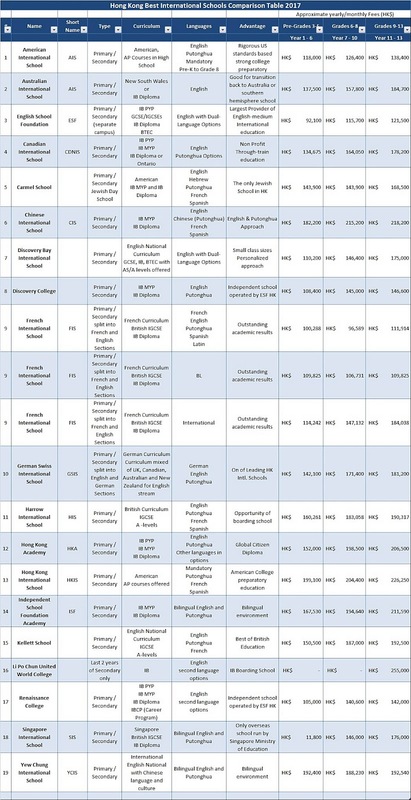 So I browsed the Internet to study the various Hong Kong International Schools and their respective prices. Upon my searches, I stumbled across an interesting article from Hong Kong Tatler listing the Best International Schools in Hong Kong 2017 (read full article here). Based on this article I decided to create a table to be able to compare them at one glance instead of having to go back and forth with the slides in the article. The list above is non exhaustive and only based on the article from Hong Kong Tatler (read full article with more details about each school here). Therefore the total amount in the table and in the chart may vary depending on the school and the grade, and the additional fees. Hope it will help other parents to easily make their choice. NB: This blog is usually mainly about wines, but from time to time I like to post things that I think could be useful.